Fashion industry got a healthy tendency of changing its vector from anorexic beauty of 90`s up to plus-sized models. Many of nowaday public persons follow the curvy figure trend and I bet you’ll agree that millions of woman not only feel more comfortable. The pioneer and trendsetter of new iconic body type is Kim Kardashian. Many women boosted their confidence, and hundreds of them try to copy famous proportions and look similar thanks to workouts or plastic surgery. One of those beauty-followers is Anastasiya Kvitko, Russian model. Showing off her vibrant curves in Instagram, she claims that her body was made only by mix of hard work in gym, diet and given by nature body type. Is it true? We can only guess. Two years ago nobody had a clue who she is, but in short time period Anastasiya became popular in social networks. Nowadays she is filming in musical clips, advertisement and professional photo shoots, and keeps posting provocative photos in her Instagram account. Anastasiya was born in 1994 in Kaliningrad, Russia, in her teens moved to Moscow keened to be a model. Back in that time she didn’t succeed. One random photo shoot changed her life and made her popular. After photos were published she started to get advertisement contracts and contracts from magazines. The other stage of her career began when she started publish hot half naked snaps in her Instagram account, copying Kim Kardashian style. 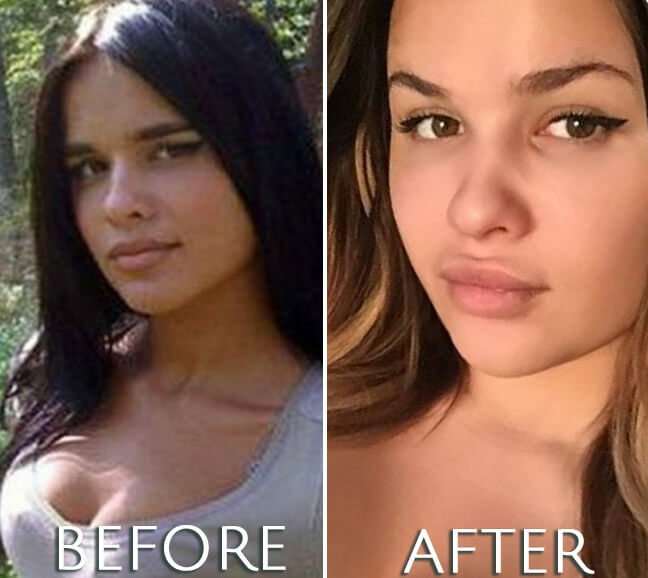 Even though Anastasiya became popular thanks to her curvy figure, it’s easy to notice changes in her nose shape. It looks straightened with lifted up tip. Not necessary was a surgical manipulation, it could also been made by liquid rhinoplasty, performed only by injections. And narrower shape could be reached by a well-performed contouring technique. Sum up changes on between before and after photos she hasn’t got an artificial look, that doesn’t suit her. Was it done by plastic surgeon or not, overall her profile is more aesthetically balanced and looks naturally now. Anastasiya had naturally-full lips before she became popular. 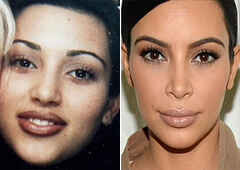 But if we take a closer look at before and after photos we may recognize that her lips gained volume, especially noticeable upper lip changes. The upper lip became fuller with significant shape, cupid’s bow more narrow and located differently, closer to nose so philtrum shortened. 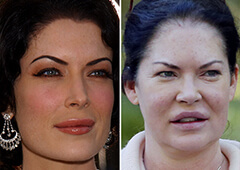 The lower lip changed a little, volume was added to symmetry and for better balance between lower and upper lip shape. There are two options to perform this kind of effect, filler injections or plastic surgery. The difference between before and after photos is not colossal, there is no complete change, but there is some. 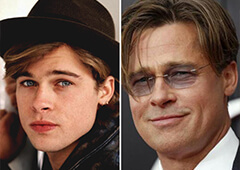 Possibly, injections have given that shape, and the reason of lip augmentation. Indeed, Anastasiya Kvitko is called russian Kim Kardashian, her possible plastic surgery list isn`t so long. She claims that appendectomy is the only surgery she was urged to undergone. Comparing before and after photos it’s a bit hard to distinguish nowaday Anastasiya`s look at the early photos. She definitely improved herself, and, obviously, made a great effort. 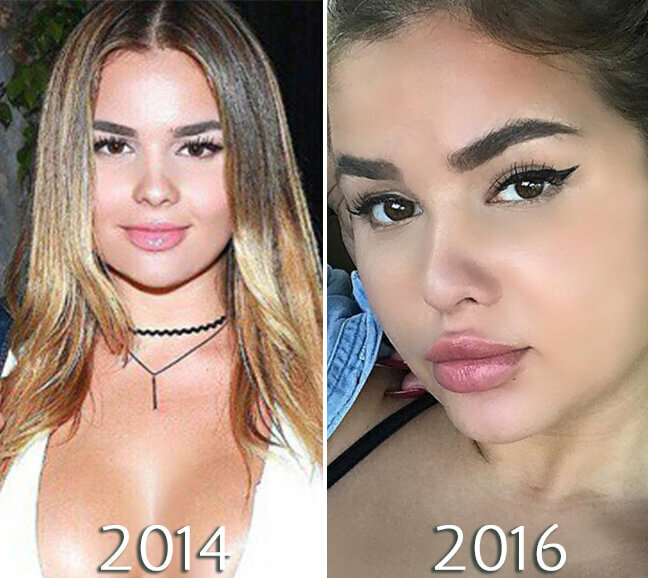 That changes were made by plastic surgery or by Anastasiya Kvitko herself, her dieting and engaging in athletics, we can only guess.